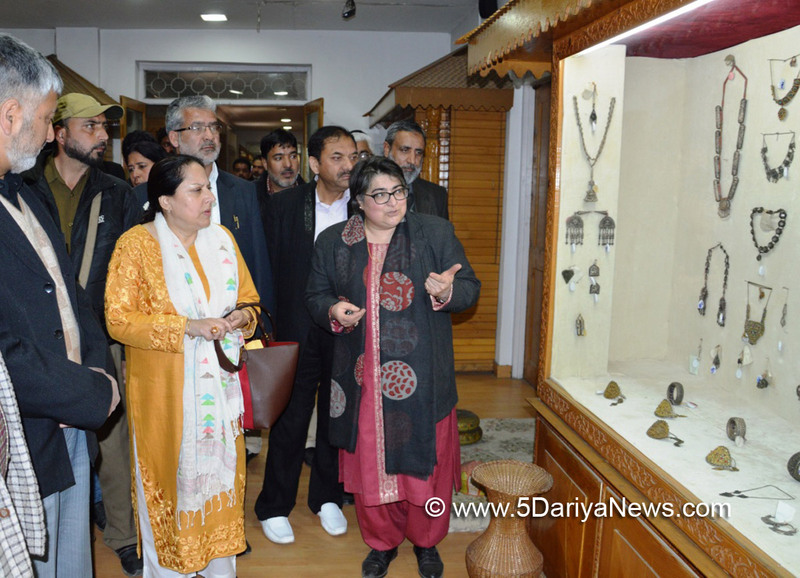 Minister of State for Industries & Commerce and Housing & Urban development, Asiea Naqash Thursday visited the Kashmir Haat here to take the first-hand appraisal of the functioning of the various sections of the Haat. The Minister inspected various sections including the Craft Museum, School of Designs, Massive Carpet Scheme (MSE) showroom and stalls surrounding the Haat’s lawns. While inspecting the Designs section at the Haat, Asiea was informed that the Department is actively involved in innovations in designs across all forms of handicrafts, including Kani shawl, copperware, wood carving, papier-mâché, carpet including namda designing, ceiling panels, sozni wall hangings, table runners, cushion covers, willow wickers, lamps and tapestry.It was given out that Rs 42 crore proposal for renovation of Kashmir Haat is under pipeline so that its heritage and traditional market value of Kashmiri handicrafts will be developed on modern lines.The Minister said innovations in designs is the need of the hour to succeed in export market and called for sustained efforts at design innovations. She also said there is need to preserve centuries old designs as well as quality for the taste of international buyers. Interacting with the artisans, the Minister said that the traditional arts and crafts symbolize the treasured cultural heritage and splendid civilization of Jammu and Kashmir which need to be preserved and promoted in a big way.She called for innovation and better packaging of the local craft items to boost their marketability and ensure better returns.Asiea said Kashmiri handicrafts are known throughout the world for their artistic work and grandeur. Kashmiri handicrafts are in tune with its age-old splendid civilization, which has been perfected over centuries.Later, Minister inspected various sections of the Haat for on-the-spot review of the facilities available to the local artisans and tourists at the traditional market.Asiea said handicrafts is J&K’s traditional asset and there is need to make the Kashmir Haat more appealing to people and also to attract tourists.She directed Director Handicrafts to start the work of renovation of stalls, repairment of paths, water pipes & fountains and landscaping. She also asked him to ensure round the clock security in the Kashmir Haat.Minister also directed SMC Commissioner to start special drive on daily basis for proper sanitation in and around the ground.The shopkeepers and artisans highlighted various problems confronting by them to the visiting dignitary and she assured them that their demands will be fulfilled on priority basis.Asiea urged Industries and Commerce and Handicrafts departments to provide support to artisans and local as well as international sellers which are the back bone of industrial economy.